Please take a look at our newest adoptable dogs and whether you are looking for the perfect face, the perfect demeanor, or it's love at first sight, hopefully you will find the perfect companion at HITTGV! We are also in need of people who can support us as fosters! You can also foster a dog until the perfect forever home is found or as a trial period with the option to adopt. We're Sorry, But this event is sold out. The number of dogs we can pull from the shelters and save from death is directly related to the number of foster homes we have available. Sometimes it only takes a little time to network a good dog to find just the right fit. By using our foster families, we can accept more dogs before their time runs out and give them the best chance to find their new home. Fostering can be for a very short time, or longer as needed. If you can foster a dog just let us know what you are willing to commit to and we will find the right match for you. Medical expenses are paid for by us (with prior approval)—all you need to do is feed and fulfill the basic needs for the foster dog. To learn more about our fostering program, click here. Please complete our Foster form if you would be interested in fostering—you could be saving a precious life. Please download, complete, and return the Foster Care Application form. If you do not get a confirmation that your application was received, please contact us another way. I volunteer to care for any animal placed with me until a suitable home can be found. This includes avoiding or removing the animal from stressful and provocative situations to my fullest ability. Any and all reimbursement for expenses I incur on behalf of any animal in my care, must be preauthorized by the president, acting-president or treasurer of Herd It Through The Grapevine, Herding Dog Rescue (HITTGV). Under no circumstances may the animal be sold, traded or released to any other person, shelter, or facility/entity unless authorized by HITTGV. I understand that the animal in my care is of sound temperament, and as such, I will not hold HITTGV liable for acts committed by the animal while in my care. I release, discharge and hold harmless HITTGV, and anyone else associated with HITTGV from any charges or claims arising during fostering. CARE: I will care for any dog I foster humanely, including the provision of adequate exercise, food, water, shelter in the family home, and access to veterinary care, and he/she will be contained in accordance with the laws of the jurisdiction in which it resides. The dog is to be exercised in a responsible controlled manner and is not to be free to roam the streets. I agree that should I choose to adopt an animal in my foster care, I will immediately notify an authorized representative of HITTGV of my intention. I understand that adoptions by foster volunteers require approval by HITTGV. If approved, terms of adoption donations will be determined at a time prior to my desired adoption. I volunteer to care for any animal placed with me, until a suitable home can be found. I have read and agree to abide by the terms of the foster agreement regarding the care I must provide. Many of the dogs that we rescue are saved only hours or even minutes before they are due to be euthanized. Others are sent to us because for any number of reasons, their current owners are unable to keep them. Herding dogs make wonderful companions for those who can give them the time and the outlet for their energy. They are not “lap dogs” who will be happy sitting on a sofa all day, but their energy and loyalty can provide the right home with unending love and enjoyment. Help make a HAPPY ENDING for a rescue, fill out an adoption form. Please either download, complete, and return the adoption form. All potential adopters must be at least 21 years old, and have current identification, with a verifiable address and phone number. The offline adoption form can be downloaded in either: PDF, DOC, or DOCX format. Adoption Fee: We have an adoption fee, which is typically $250 per dog. 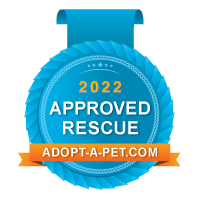 This fee helps to reimburse our rescue for some - but not always all - of the veterinary and other costs incurred in the process of rescuing and caring for each dog. To see how adoption fees are spent, click here.